It’s obvious that we’re a little obsessed with kimchi here in the Marley Spoon kitchen. With its bright tanginess and spicy crunch, it’s hard to see why not. While we love kimchi, we’d also like to introduce you to a few other mainstays of the Korean pantry. When most people hear Korean food, they usually think barbecue… but there’s so much more to Korean cuisine than grilled meats. In fact, Korean food is great for vegetarians and vegans, with an abundance of vegetable based dishes. The ingredients below are a few essentials of the Korean pantry, used in everything from “banchan,” the small side dishes that come with every Korean meal, to soups, stews, and marinated meats. Koreans use a particular variety of short grain rice, which gets cooked into the soft, sticky bowls of warm rice served at nearly every meal. This is a fermented soybean paste which lends many Korean dishes their salty, umami flavor. It’s similar to miso paste, but more pungent, and is used as the base for stews and sauces. A paste made from Korean red chili peppers, gochujang is much milder and sweeter than you’d expect. It’s used in many dishes, such as stir fried rice cakes and dipping sauces. Along with doenjang, it’s the foundation of Korean flavor. Koreans use seaweed in multiple forms, including brown seaweed, eaten in soups and side dishes, sea kelp, used for stock, and our personal favorite, dried and roasted seaweed strips eaten as salty snacks. The toasted, nutty flavor of sesame oil provides a burst of flavor that enhances many Korean dishes with just a few drops. Sesame seeds, toasted and sprinkled on top, deliver the same flavor in a more compact form with a delightful crunch. We could talk endlessly about the varieties of soy sauce used in Japanese, Chinese and Korean cuisine. While the type of soy sauce you choose often depends on preference (Kikkoman works just as well in Korean food as other common brands), most Korean mothers will insist that you pick up a bottle of Korean-made soy sauce, like Sempio. Soy sauce in all cuisines is made from fermented soybeans and wheat. Like soy sauce, fish sauce appears in multiple Asian cuisines. Korean fish sauce is made in the same way as the Thai and Vietnamese versions, through the fermentation of dried fish. While anchovy sauce is an important part of kimchi-making, Korean fish sauce is also made from sand lance fish and shrimp. As you’ve probably realized by now, Koreans love all things fermented. 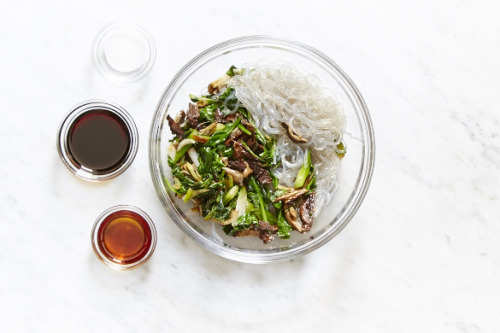 Now that we’ve given you a basic introduction to a few essential Korean ingredients, we’d recommend cooking up some easy Korean dishes like our Kimchi Drumsticks with Glass Noodles, Kimchi Pancakes, or Beef and Rice Bowl. Some other ingredients you might want to have on hand are rice wine, sweet potato noodles, garlic, ginger, and scallions. With these in your pantry, you’ll be ready to tackle all sorts of Korean dishes.